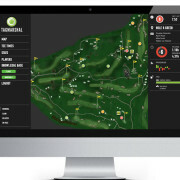 One of the many features of the Tagmarshal golf pace of play tracking and field management system is the ability to broadcast live fields on screens in select area’s in and around the clubhouse, pro-shop or halfway area. This means players and members can now keep and eye on their buddies pace setting performance. “Too slow and you’re buying the first round!” #whilewewereyoung. Tagmarshal’s unique alert mechanism enables on-lookers to differentiate between fast (green) or slow (red) four-balls by viewing the colour of each playing group’s icon. Is fourball delayed by the group in front? The classification system will demarcate your group’s icon orange, acknowledging delayed and not at fault. Live tracking of playing groups including their pace of play status allows for increased self regulation and shows your players and members your course is proactive about pace of play and values their experience. Are you interested in learning more about the Tagmarshal pace tracking and field management system?